Get your calendar out, because the 2016 American Foundation for the Blind Leadership Conference is full of events you won’t want to miss. “Cerebral/Cortical Visual Impairment: A National Conversation” is a special day-long event that will take place on Thursday, March 3 (this event requires a reservation and space is limited, so please register early). Are you a CareerConnect Mentor? Have you ever thought about how important having a blind or visually impaired mentor could be for a teenager with vision loss ready to take his first tentative steps into the world of work? Or where a successful businesswoman might turn for answers if she experienced a sudden loss of vision? To AFB CareerConnect mentors, of course! 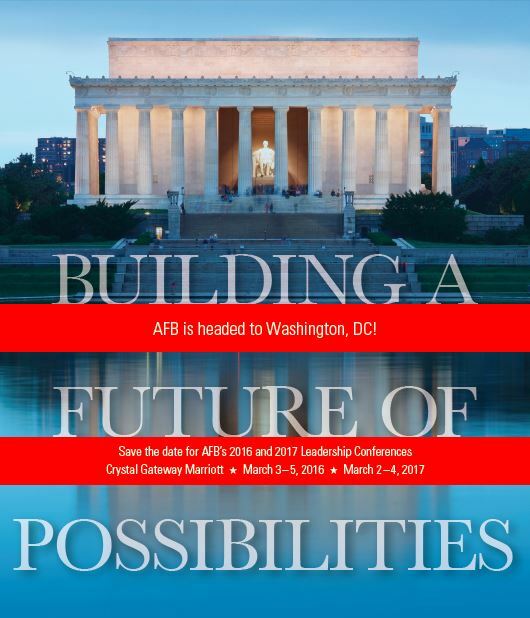 Current and prospective mentors are invited to gather for conversation, food, and drinks at the AFB Leadership Conference in Washington, DC, from 5 to 7 p.m., on Thursday, March 3. Space is limited to the first 25 who RSVP to Neva Fairchild before February 25. Call 214-438-5316 if you have questions. It’s our 95th anniversary! Join us for a celebration of our 95 years of excellence, and visit with Carl Augusto as we toast him on his well-earned retirement from AFB. The party begins at 8 p.m. on Friday, March 4. The Migel Medal Luncheon is always inspiring—make sure you indicate that you’re attending when you register for the conference. And if you’re able to stay a few extra days, Crystal City, Washington, DC, and the surrounding areas are full of exciting events and attractions. Check out our list of things to do and see for more ideas. Want more information on the conference? Check out the agenda and then register today. And don’t forget to reserve your hotel room at the beautiful and centrally located Crystal Gateway Marriott. Conference attendees receive a special group rate of $189/night. This rate is good from March 1-6, so come early or stay late and take in all that Washington, DC, has to offer! Please book through our Marriott reservations page or call 1-703-920-3230 and let the reservation specialist know that you are attending AFBLC 2016. Be sure to indicate that you are staying at the Crystal Gateway Marriott as there are two Marriott hotels in Crystal City. Rates go up at 6 p.m. on February 13, so don’t delay! Now is also an excellent time to consider sponsoring the AFB Leadership Conference. With an audience of more than 400 of the top decision makers in the blindness field, your sponsorship can pay huge dividends. Contact us for more information or to customize a package for your specific needs. We also have exhibiting and advertising opportunities— please take a look at our options and let us know if we can help you to reach this important audience.